At Tires Plus You're in the driver's seat! we're working harder to get you back on the road faster experience the plus side! Save money and take care of your car, all at the same time. Provide your email address and be the first to know about the latest tire coupons, service offers, and sales. Don't wait on a new set of tires. They're more than four chunks of rubber: your tires are your car or truck's most important safety feature! Check out our latest tire promotions for a selection of coupons on Bridgestone, Firestone, and other leading tire brands. These discount tire offers are sure to save you money! Save on important auto services and repairs with these limited time deals. From oil change coupons to discounts on batteries, air filters, windshield wipers and more--you can save on almost any service. Take care of your car with these great discounts and your car will take care of you! It’s one of the big reasons for the “Plus” in our name. We offer a wide variety of auto repair services for your car, truck, or SUV, all done quickly and affordably. Whether you need a new battery, new brake pads, an engine repair, flat tire repair, or regular wheel alignment, our auto repair specialists will fix your car right the first time. Life never stops, and neither should your car! When you take care of your vehicle, you also end up saving money. Preventative maintenance like regular oil changes, safety inspections, battery tests, tune-ups, and important fluid flushes can all help your vehicle stay in tip-top shape. Whatever the driving conditions, make sure you can beat them. View your vehicle’s recommended maintenance schedule to get started! 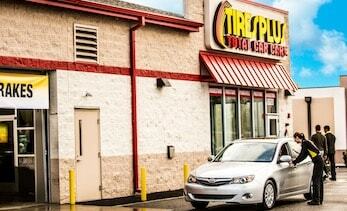 At Tires Plus, there’s a lot behind each word in our name. When it comes to tires, we have thousands of them for all vehicle types, and we’ll give you a quick, free quote. And with our "Best Tire Prices" Guarantee, we’ll match any locally advertised price. Find a better price within 30 days of purchase, and we’ll give you twice the amount of the difference. *Discount cannot exceed $25.00. Valid at any company–owned Tires Plus location. The subsequent second visit must occur within one year of the original service. This discount cannot be used to reduce outstanding debt.